On Friday night I caught a preview of Ridley Scott’s much anticipated Prometheus, and since despite the slightly OTT security they didn’t make me sign anything agreeing to an embargo, I thought I’d record my thoughts about this flawed, frustrating but intermittently brilliant film. The first thing to say is that you should ignore the misinformation about it not being a prequel to Alien, because it is, quite explicitly (and sometimes to its detriment). Indeed if you’ve seen the trailer you’ve probably got the basic idea: trail of archaeological clues lead humans to distant planet, hope turns to terror, horrible secrets consume them. The film opens on a suitably epic note, with aerial images of a stark, volcanic landscape. The sense we are watching a sort of creation is powerfully evoked, partly by the stirring music, partly by the manner in which the landscape itself echoes the deep structure of biology. Eventually the camera moves in on a figure, which then casts off its cloak to reveal a figure both alien and familiar: a luminously pale, bald, over-muscled giant, who then decoheres, and is absorbed into the thundering water beside him. In a way it’s a moment that sets the scene for all that follows, combining as it does the visual majesty and brilliance of the film as a whole and the disappointingly unadventurous set of ideas at its centre. Yet the viewer has only a few moments to think about it before the scene shifts to an archaeological dig on the Isle of Skye 70 years from now, and the discovery of what is revealed to be the latest in a series of ancient paintings depicting giant figures gesturing to a particular celestial formation, and then again to a ship en route to a moon orbiting a ringed planet around the stars shown in the painting. It’s a narrative sequence that explicitly invokes 2001, a reference that is underlined both by the design of the ship and by the scenes of Michael Fassbender’s android character, David, moving through the empty ship, as Keir Dullea’s David Bowman and Gary Lockwood’s Frank Poole do in Kubrick’s film. These scenes with Fassbender are masterly. As David moves restlessly through the ship, bouncing a basketball, monitoring the crew in cryostasis, studying ancient languages, we glimpse both his solitude and his slightly unsettling self-containment, a combination that is made the more disturbing by a pair of scenes in which he watches the dreams of Noomi Rapace’s archaeologist, Elizabeth Shaw and rehearses the voice of Peter O’Toole’s Lawrence of Arabia. As ever Fassbender is completely magnetic. Given his capacity to project complexity and intelligence yet remain opaque, he is perfectly cast as the amoral David, yet in a way it’s his physical performance, from the oddly off-kilter squeaking of his slippers on the spaceship floor in the opening scenes (itself a playful reference to the sticky slippers of the space hostess in 2001, as well as a piece of pleasingly Kubrickian weirdness, I suspect) to the way his bleached hair and stick-insect delicacy seem to channel not just O’Toole’s Lawrence but David Bowie’s performance in Nicholas Roeg’s The Man Who Fell To Earth that are most memorable. Yet like much else in the film, and the brilliance of Fassbender’s performance notwithstanding, David is a creation that gestures towards greatness without ever quite achieving it. Partly that’s because despite several great scenes (one in which he asks whether the humans might be disappointed to discover their alien creators, the “Engineers”, made them for the same reason they made him – because they could – is particularly impressive) his intentions and agenda are never really clear. But it’s also because like so much in Prometheus it’s difficult not to feel we haven’t seen this before. Despite the brilliance of Fassbender’s performance, David feels like an ambulatory reworking of HAL, or indeed any number of unreliable, out-of-control androids in fiction and film. Archaeologists Charlie Holloway (Logan Marshall-Green) and Elizabeth Shaw (Noomi Rapace) explore the alien installation with the android, David (Michael Fassbender). This sense the film is reworking extant themes is partly deliberate. As the title suggests it is a film grounded in other texts, some classical, some filmic. As well as the repeated invocations of the story of Prometheus (the story of the expedition, the story of the fate of the alien Engineers, the creation of David and David’s quest for knowledge) there are references not just to Old Testament sources and other religious sources (and indeed the work of Erich von Daniken, which draws upon both), the now-extensive mythology surrounding the original Alien and its sequels and spin-offs, films such as 2001 and finally to Scott’s own oeuvre (the opening scenes of the film, together with the brooding reminders of the mystery of the afterlife seem to speak to the scenes of the wind on the wheatfields and Russell Crowe’s monologue about the same in Gladiator). This sort of textual overdetermination is common in SF, helping underpin not just the sorts of strategies of estrangement it employs but the extremely fertile and generative ways it relates to reality. Yet in Prometheus it often seems to do exactly the opposite, suggesting not new understandings but gesturing towards old ones, whether in the form of the repurposing of the plot of 2001 (ancient artifact, trip to stars, crazy computer, impossible secrets), or the reminders of Blade Runner, Alien and Aliens (psychopathic androids, greedy corporations etc etc). Even the soundtrack keeps sounding like it’s suddenly going to break into ‘The Flying Sequence’ from Superman: The Movie or the opening credits of Star Trek: The Next Generation. This is a pity because so much of the movie is so good. Not only is it visually stunning, there are moments of pure horror (the first alien death isn’t something you’ll forget in a hurry) and – perhaps more importantly – a real sense of wonder and transcendence lurking between the banal debates about faith and origins (the scene in which David watches Elizabeth’s memories of a Hindu funeral is particularly well-judged in its subtle reminder not just of fire and death, but the many-faced nature of belief). This combination of genius and muddle (and indeed the preoccupation with death and transcendence and the afterlife) is present in a lot of Scott’s films, even the more successful ones like Gladiator, but it’s particularly evident in Prometheus. But the real problem is that the ideas at the centre of the film just don’t measure up to the filmic firepower brought to bear on them. It’s not just that many of them aren’t very well-developed (I was fascinated by the suggestion all human languages were rooted in an alien tongue we could track back to, for instance). Or even that when you think about it the plot doesn’t make much sense: (comments invisotexted to hide spoilers – just highlight to read) why did the Engineers build the Aliens? To destroy us? But if they’d created us surely there were easier and safer ways of doing that? And why point us to the moon in the film if they only meant to destroy us? And more importantly, if the facility on the moon was destroyed 2,000 years ago, why are they pointing to it in 35,000 year-old paintings? Surely it didn’t take the Engineers 33,000 years to create the Aliens? Instead it’s that the set of questions the film is investigating are so utterly banal. It’s a problem that’s obvious in the whole conception of the Engineers and our reaction to them. We’re told several times over the quest to find them is about understanding where we came from. But is that really the most interesting thing about discovering we are the products of an alien genesis? The film might be making a point about human solipsism here, but surely the most important thing about aliens is that they’re, well, alien? Isn’t contact with another species a more important and transformative possibility than discovering we are their progeny? More deeply though, the alien Engineers aren’t very alien. Some of their tech is incredible – the navigation device David triggers in the starship is a remarkable creation – but there’s something both banal and slightly dispiriting about the fact the Engineers, once we see them, are basically large, over-muscled soldiers of some kind. I assume this is partly about reinforcing the notion that they’re Titans in a Promethean sense (presumably the presence of Saturnian rings around the planet the moon orbits is meant to reinforce this as well), as well as some kind of Old Testament, Giants in the Earth kind of thing, but it also reveals a real paucity of imagination. In a way this isn’t surprising to me, especially given the film was written by Damon Lindelof. Lindelof – who together with J.J. Abrams created Lost and helped produce Star Trek – is one of the wunderkind of contemporary Hollywood, not least because he’s revealed over and over again he, like Abrams, has a real knack for creating the sort of mind-bending situations that made Lost so tantalising, at least in its early stages. I think it’s fair to say Lindelof, like Abrams, is an artist of the ephemeral. His worlds are ungrounded and ultimately meaningless because they don’t seem to connect with deeper images and archetypes. It’s a problem that’s very apparent in Lost, although perhaps more obviously in a film like Star Trek, in which an entire planet is destroyed and it barely resonates, either with the characters or the audience, but it’s also very evident when one compares a show like Fringe to The X-Files and sees the way the latter drew so much of its power from its capacity to tap into deep anxieties about surveillance and the uncanny. Time and again, in both Lindelof and Abrams’ films and shows, we see worlds that are constructed out of secondary sources, geektastic assemblages of gimmicks and references to other films that never exceed their source material (Cloverfield Super 8, a film that is designed not just to mimic the plots but the look and feel of E.T. and Close Encounters is particularly guilty on this score). Equally important is the fact that Lindelof is much better at creating situations than resolving them. Almost every show he’s been involved with, from Lost to Once Upon a Time, has a brilliant set-up that is gradually revealed to be considerably less interesting than it promised to be (I’d exempt the unfairly-maligned and rather brilliant Cowboys and Aliens from this argument). I’ve written before about this problem, which is at least partly a function of the way conventional narratives demand resolutions that are at odds with the possibilities they create, something that’s very true with Prometheus. Here the problem is compounded by the need to connect the film to the original Alien (and set up a new franchise) and the manner in which that connection’s explicitness undermines the film’s resolution by locking it into a plot-driven resolution. But it’s also a function of the film’s inability to find a deep, archetypal foundation for the sorts of questions it wants to explore. This isn’t a problem for Prometheus alone. American film and television seems increasingly to fall back on asinine arguments about faith and belief when confronted with big ideas. “It’s what I choose to believe” the characters in Prometheus say more than once, as if this somehow answers any challenge to their beliefs, or is a meaningful answer to the somewhat sizeable question of what happens to us after death. But quite aside from the question of whether any scientist worth their salt would say something so stupid, this sort of declaration reveals the inanity of the sort of faith-based solutions being proposed. Belief isn’t enough on its own, and neither are the unanchored ideas of spirituality that recur in American film and television. I suspect this inanity is partly about the manner in which consumer capitalism has decoupled culture and traditional religion. Despite its religiosity American culture has largely given away the symbols and narratives that underpin traditional religion. This might seem an odd thing to say given the rise in fundamentalism, but in fact the two aren’t incompatible: what matters isn’t the narratives but belief, not just in God but in America. A threat to one becomes a threat to the other. The culture of Hollywood may be less religiose, but in many ways it’s part of the same phenomenon. Severed from the traditional narratives of religion, writers and filmmakers fall back on the inane language of personal growth and faith, a language and discourse that is incapable of plumbing deep because it’s essentially ungrounded. In place of the deep symbols of religion we have exhortations to belief and faith, as if these were ends in themselves. It’s not helped by the weight of expectation and marketing behind Prometheus. I sometimes think there’s an argument to be made that SF, especially on film, works better when it’s essentially subversive: certainly films like Alien work at least partly because they’re so unexpected, a quality that is much rarer in the lumbering, carefully calibrated studio SF produced by contemporary Hollywood. 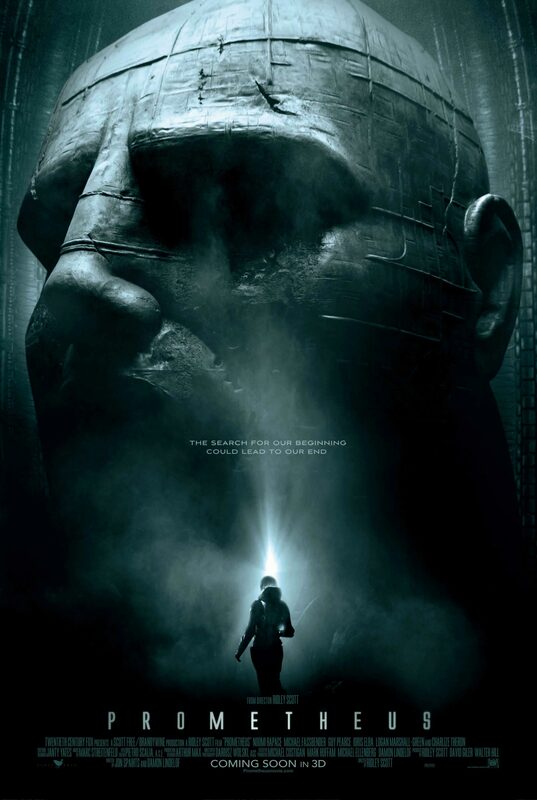 But either way it’s difficult to escape the feeling that unlike a film like Alien (or indeed Aliens) which remains fresh today at least partly because it’s so spare and direct and uncalculated, Prometheus pretends to a significance it doesn’t possess. Not just because when you strip away the brilliance of the craft and visual imagination that’s been brought to bear on it the ideas are, frankly, a bit naff, but because it’s so obviously a vehicle designed to set up a sequel, and to connect to the existing films. In doing this it certainly doesn’t damage the originals in the way George Lucas’ horrible and horribly misjudged Star Wars prequels did, but it does make the viewer uncomfortably aware that what they’re watching isn’t really a work of the imagination but the central plank in a vast marketing machine, and, because of that, essentially hollow. Yes, it is a frustrating experience, partly because so much talent and skill is lavished on material which is both second-hand and oddly unclear. Michael Fassbender dazzles, but there are a number of other beautiful performances – Charlize Theron brings an icy brilliance to her role, and Idris Elba, despite a wayward accent, is charming – this despite the fact they’re playing fairly formulaic characters. But where the movie falls down for me is that it’s structured around a series of reveals which aren’t really reveals if you’ve seen a trailer (and who hasn’t) but which also aren’t even clear. Stuff happens, but what’s really going on never quite comes into focus, and not in ways that are fascinating and ambiguous either. It just doesn’t quite make sense. The shadow of the original keeps following you all the way through, too: the structure is still there, as the people get picked off one by one, and you find yourself wondering whether the chick’s going to make it this time; how they’re going to top the chest-burster sequence; whether when the survivor gets into the lifeboat at the end there’s going to be one more fight to the death etc etc. They do find variations, but it feels like they’re finding variations rather than creating something really fresh. And the android-without-a-soul thing kept reminding me of all those stories in Star Trek The Next Generation when Data made a new discovery about what it really means to be human (dreamy android sigh). Idris Elba is terrific in it, and Theron is good as well, although her character is less interesting. And I think it’s telling the one truly shocking moment is the first death, which is basically a reworking of the stomach bursting scene in Alien. 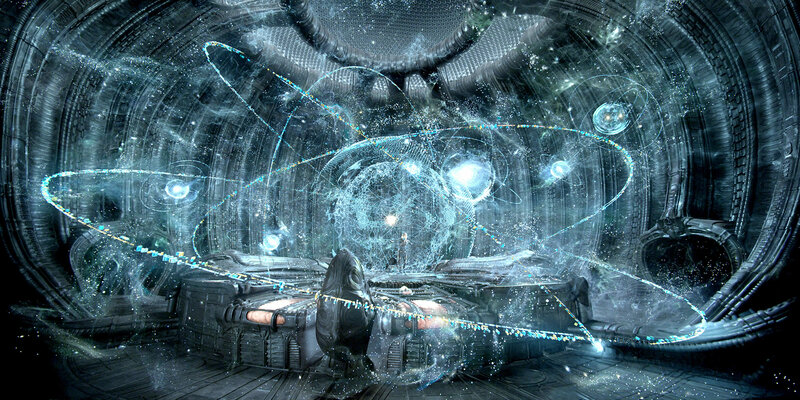 At least Prometheus will look amazing, considering the pre-production budget Scott demanded to assemble a design bible. Right? RIGHT? This was a brilliant article! giant evil octopuses. They’re very Lovecraftian. Anyway, I always thought the power behind the initial Alien franchise was the rather terrifying suggestion that malevolent parasitical beasts could somehow spring up elsewhere in the universe merely through the normal courses of evolution; and that when humans encountered those beasts, the results could be very gory indeed. (Essentially it’s the same concept as Robert Heinlein’s The Puppet Masters). To have that explanation replaced with some kind of elaborate scientific creation myth is more than a little disappointing. I have one word for you: midi-chlorians. Er… sorry about that. Anyway, I think Louis Macneice said that after a certain period while poets shouldn’t be allowed to alter their works. The same dictum could be just as well applied to film franchises. Great post that I will be interested to reread once I’ve actually seen the film. One (very minor) point, I wonder if you mean Super 8, rather than Cloverfield, mimics ET and Close Encounters. Gah! You’re right. Will fix. Wow, even after dialling my expectations back, on seeing this film it’s hard to believe how truly lazy the story-telling was. As you have said James, there are just no stakes. More to that, there are no scares either, and this is an Alien film! Though, Michael Fassbender was so mesmerising, for me that made it worth seeing. Plus the production design was gorgeous. There is a huge difference between allowing some things to percolate in the mind of audience, and just not bothering for tell a solid story. 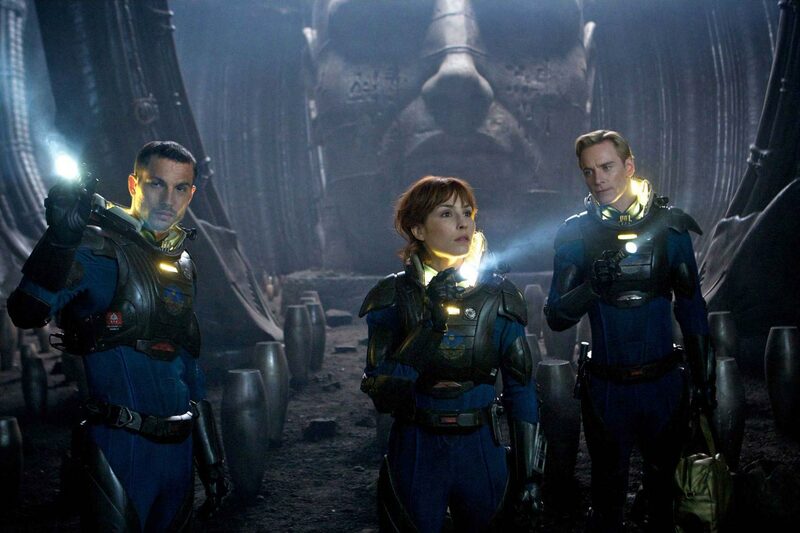 Prometheus serves as a two-hour trailer for its own sequel. If that sequel doesn’t eventuate, then it’s just an extremely poorly told and rather ponderous story that dances around some interesting questions while managing to not engage with them in any meaningful way. Argh, damn you, Damon Lindelof school of lazy script writing! It’s funny, isn’t it? So much of the detail is great, but it’s so inane and secondary and sloppily plotted it doesn’t really add up to anything other than the groundwork for a new series of films. James, I think your last comment (“… the groundwork for a new series of films”) says it all. I keep on thinking that the film was either too long or too short, too much a copy of the first ALIEN and not enough. It seems to have dropped into a no-man’s-land of indecision not knowing what it wanted to be. I’m not sure if you recall, that, other than the sf fan community, the original ALIEN suffered from similar criticisms: is it sf or horror? In fact it was both, and worked well because of it. But we have to remember that ALIEN was the first sf/horror film that attempted to be an A-movie, rather than a B-grade second feature. PROMETHEUS looks good and I actually enjoyed it while I was in the cinema – that was the fanboy coming to the fore – but once I was home and thinking about the plot-holes it started to come down a few notches. As you say it just needed a better script. If Lindelof’s best work seems to be COWBOYS & ALIENS it might be because that was an adaptation of someone else’s work. Maybe he should just stick to that. One of the creepiest and most memorable scenes in Alien has nothing to do with the aliens of the title, but rather with the “space jockey,” the creature with the elephantine face that seems to be growing out of the chair and was the first apparent victim of the alien. That was such a foreign and bizarre creation, and it’s a relatively small element of the movie – never explored in depth, never mentioned again, left to be explained purely by our imagination. It’s one of my favourite moments in cinema, and certainly in the horror genre. The scene in Prometheus where that face is revealed to be a helmet, and the helmet is removed to expose a human face, is literally as bad as all the Star Wars prequels put together. I haven’t experienced a moment of such utter anger and disappointment since the scene in The Village (SPOILERS) where the monsters are revealed to be fakes. This was far worse, in fact, since The Village was a standalone film that I didn’t have nearly as much of an invested history in. That was my biggest piece of grief with Prometheus, but there were dozens of other irritations – primarily, as you said, that it pretends not to be an Alien prequel but clearly is. And yet it doesn’t slot in at all, because the derelict spaceship is now surrounded by (and contains) several human corpses and ruined vehicles, not to mention that the space jockey himself is no longer in the chair. Prometheus is a strange piece of cinema, because it’s actually not a bad film at all – it’s just that it retroactively ruins Alien, far more so than any of the Alien sequels did. And it didn’t need to be shoved into the Alien franchise at all. Literally one afternoon working on that script could have turned it into a good (not great) standalone film, that needn’t ruin one of the best science fiction films ever made. Points all well taken. That’s why they’re calling it a reboot, not a prequel. 1. Holloway and Shaw seem like no scientists EVER in history. She seems utterly pissed that people don’t just believe her. With no evidence. Neither of them seem at all interested in explaining their theories or findings to anyone else. 4. …they’re travelling to the stars. But somehow infertility is still a problem. Why? 5. There seems to be no chain of command – pretty weird for a trillion dollar expedition (to say nothing of the fact half the personnel don’t seem to have been briefed); the scientists show less discipline than I’d expect on a preschool expedition and as James Tierney said, people visiting a goddamn GARDEN centre have more rigorous contact protocols than these scientists. 6. The mapping geologist gets LOST and the biologist who’s so terrified he runs away from the expedition treats the unknown squiddy thing that pops up out of the murk like a cute stray kitty. Uh huh. One of the ideas I took from this movie – that humans were left to their own devices until they developed the intelligence and ingenuity to be a threat, at which point they’d come looking for their creators (via the cave invitations) and… they’d be destroyed (judged?). Elizabeth seems to be on this stream of thought, and wants to ask them (the creators) what humans did to be judged in this way. Seems to be a pretty interesting question, although I bet the answer doesn’t live up to our imagination. Lots of food for thought, even with the problems in execution that you and the other commenters (rightly) pointed out. Thanks again!